Several months ago I made a trip to the east coast to visit the US capital. While the vacation was fantastic it would be true to say that the drive was a long and boring one, it was punctuated by a thunder storm that had us stuck in traffic for a further hour once we were within the city limits. During the entire trip I was listening to music from my mp3 player through my car stereo speakers via a FM Transmitter. 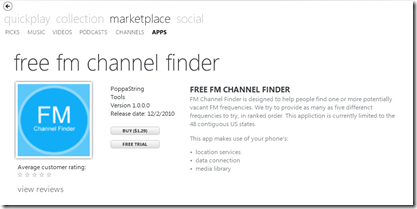 FM Channel Finder is designed to help you find potentially vacant FM frequencies to work in conjunction with your FM transmitter based on your GPS settings or zip code. Simply tune your car FM radio and FM transmitter (Belkin, SIRIUS, etc) to the frequency suggested. The application is limited to the 48 contiguous US states. The development process was really straightforward, Visual Studio 2010 Express is a great tool and provides .NET developers with a familiar environment with which to let their imaginations run wild. As to the submission process … it took less than 24 hours for my application to be certified! I was pleasantly surprised! So hear it is my first app in the Zune Marketplace!! !